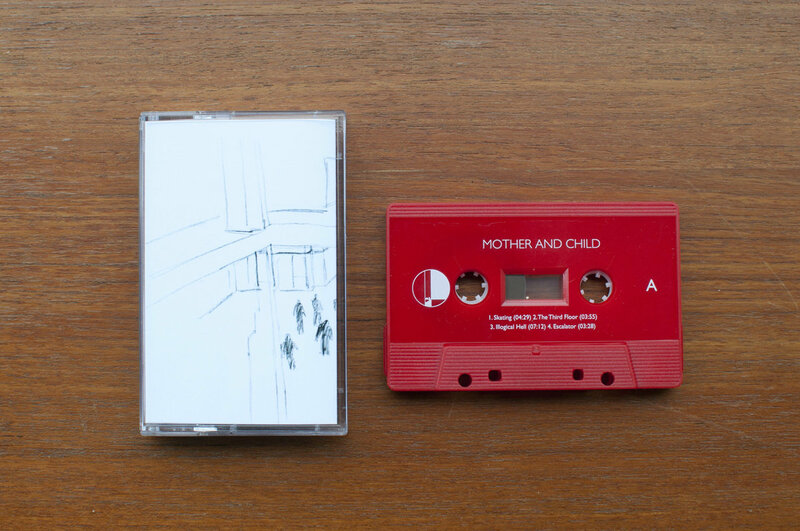 February 25, 2019: Mother and Child’s first album is here! Available as a limited edition cassette and streaming everywhere now. Click here to purchase. ABOUT THE ALBUM: The album takes place during an afternoon at a small city mall. A mother and her child arrive by car and notice that the parking lot is almost empty. They enter the mall in search of presents for the child’s father and end up picking out aftershave, a bottle of whisky, and a ballpoint pen. As they are getting ready to pay, they are unable to find any employees to help them. Other customers attract their attention through a series of remarkable actions. The situation is starting to feel unsettling, especially as a continuous stream of people start crowding the entrance to the mall. The mother decides to head up to the third floor of the mall to hide out with her child. ABOUT THE FILMMAKER:Jo Kamimura is an artist and filmmaker of Japanese and Iraqi descent. His latest feature film, “News from Chula/Juana” is an ethnographic documentary focusing on the border relationship between Mexico and the United States using locally sourced news clippings. His current work examines the fine line between documentary and fiction, creating a uniquely hermetic cinematic experience. MORE ABOUT THE SONG: “where do we go from here?” is taken from FREE AKTION’s new album “Rare Wild Blossoms”, available from from Half-Night Records now. It was written and recorded on December 31, 2016, in the aftermath of the United States Presidential Election. Written, recorded and produced by Viktor Sjöberg. Synths by Dan Olsson & Oliver Larking. Buy “RARE WILD BLOSSOMS” (Book and cassette in a bag) here. “Safe Places” sees Oskar Karlström migrating away from the sometimes unsettling landscapes that characterized “Astral Planes”, his previous Half-Night release, and further down the road towards the deeper calm that Karlström is still exploring and defining in a very personal way. Half-Night navigates the waters where relaxation and disturbance intersect, in search of something new and remarkable. “Safe Places” is just that, and we are thrilled for you to hear it. Learn more, listen to and purchase “Safe Places”. Listen to “Safe Places” on Spotify. FREE AKTION’s “RARE WILD BLOSSOMS” is here. The album is released as a high fidelity cassette and a 48 page perfect bound book featuring work inspired by “rare wild blossoms” from 15 visual artists, packaged together in a hand-dyed one-of-a-kind cotton bag. ABOUT THE ALBUM: When the external world appears to turn dark, it is easy to find distractions that prevent us from going in. “Rare Wild Blossoms” is an attempt to deal with the darkness or to challenge our perceptions of it. “Rare Wild Blossoms” is an exploration of how the healing of childhood wounds inform our understanding of the world and ourselves. FEATURED ARTISTS: Ashleah Brack, Emanuel Cederqvist, Lisa Cobbe, Russ Cobbe, Kelly Einbinder, Claudia Faro Santos, Therese Frisk, Gabriella Hasslinger, Julian Klincewicz, Alan Nakkash, Dan Olsson, Oscar Ramos, Andrew Reyes, Derek Shapton and Sven Sjöberg. RARE WILD BLOSSOMS, the new FREE AKTION album, will be released by Half-Night Records on December 13, 2018. Preorder your limited edition object at https://freeaktion.com and https://half-night.com in November. “CALL FOR LOVE” is inspired by Marianne Williamson’s book “A Return to Love”, which in turn is based around “A Course in Miracles”: “Anything that isn’t love is a call for love.” As is the case with all FREE AKTION songs, “CALL FOR LOVE” can be sung as though it is directed towards “society” or as an internal dialogue. ABOUT THE VIDEO: Jo Kamimura is an Artist and Filmmaker of Japanese and Iraqi descent. His latest feature film, “News from Chula/Juana” is an ethnographic documentary focusing on the border relationship between Mexico and the United States using locally sourced news clippings. His current work examines the fine line between documentary and fiction, creating a uniquely hermetic cinematic experience. Vocals and saxophones by Frida Thurfjell. Acoustic piano by Dan Olsson. Main drum programming by Oliver Larking. Martin White, Sonores and the Internet. Australian born, Oslo based visual artist Martin White works at the intersection of documentary and speculation. Whilst he intends to unsettle systems beyond those of the art world, his conceptual motivations pivot on issues relating to social politics and cultural history. He completed his MFA at the Norwegian National Academy of Art in Oslo in 2017. He has previously directed theatre, film and television. White’s work has been shown at film and performance festivals internationally. Solo shows include ‘Dust Biter’ at Melk, Oslo in 2018. He has upcoming solo shows at Podium and Oslo Kunstforening, both in 2019.